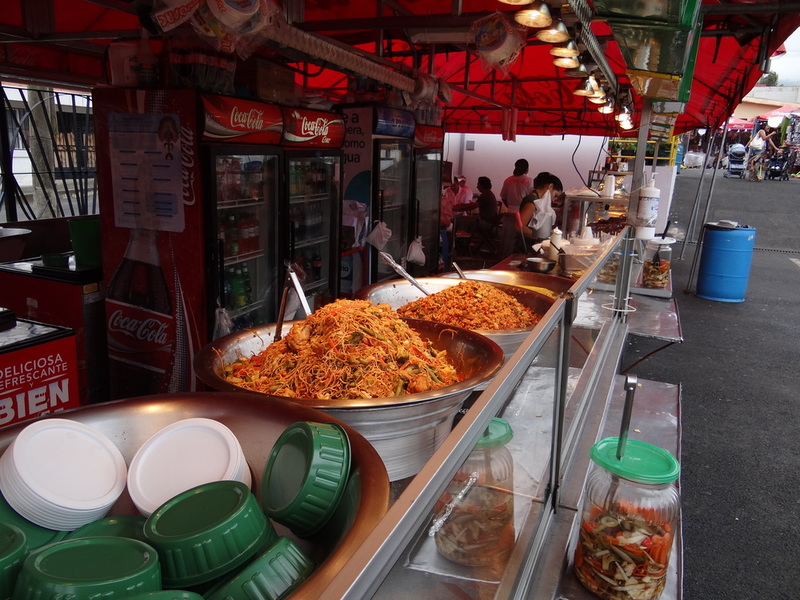 We only stopped at a handful of places on the street to buy food. 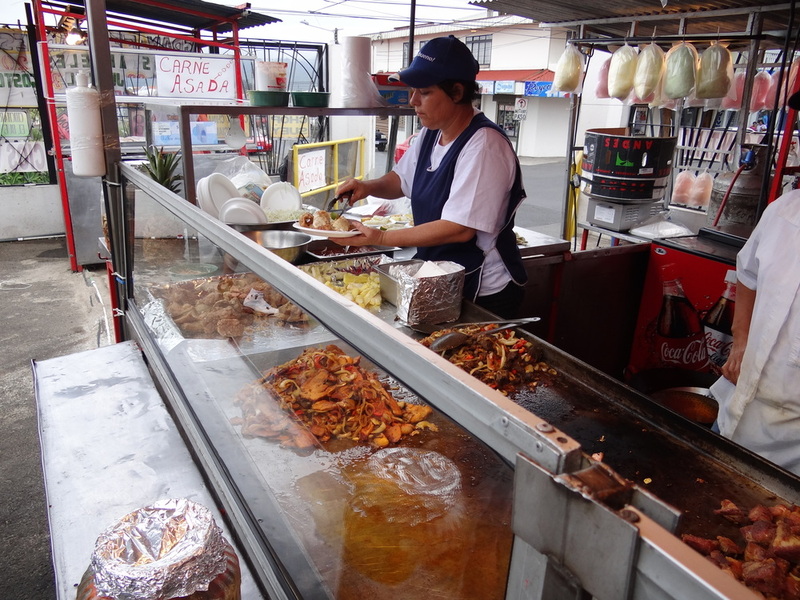 But we did take the opportunity to buy some extra-crispy chicharronnes at a food stand in Cartago, after we’d spent the day in a volcano. 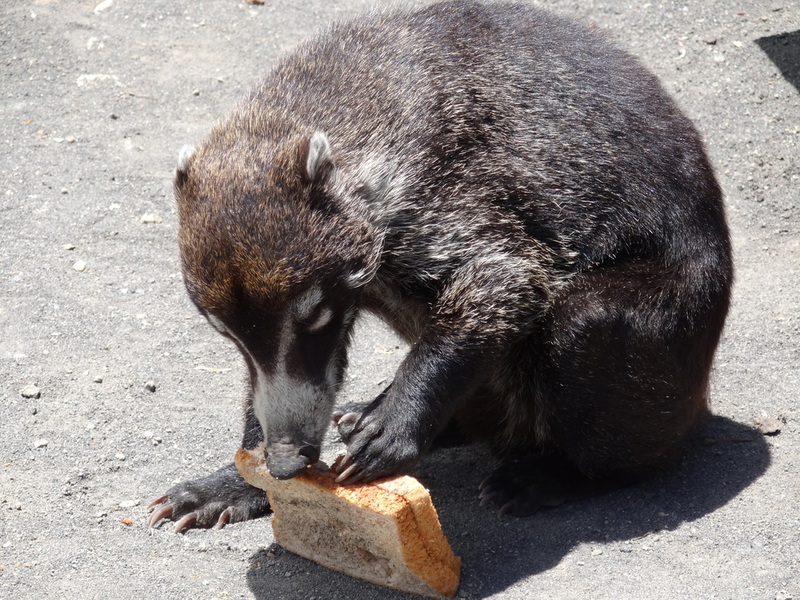 I’m not a huge fan of the extra-crispy kind, but a damn pizote stole all the PB&J’s my wife packed for lunch, and we were hungry. When you’re traveling with kids, sometimes you just say ‘screw it, I need a hamburger.’ However, on this trip it was my hermana tica who opted for the burger – she called it a “hamburguesa auténtico” by a tico, and I called it “llanura” (plain). 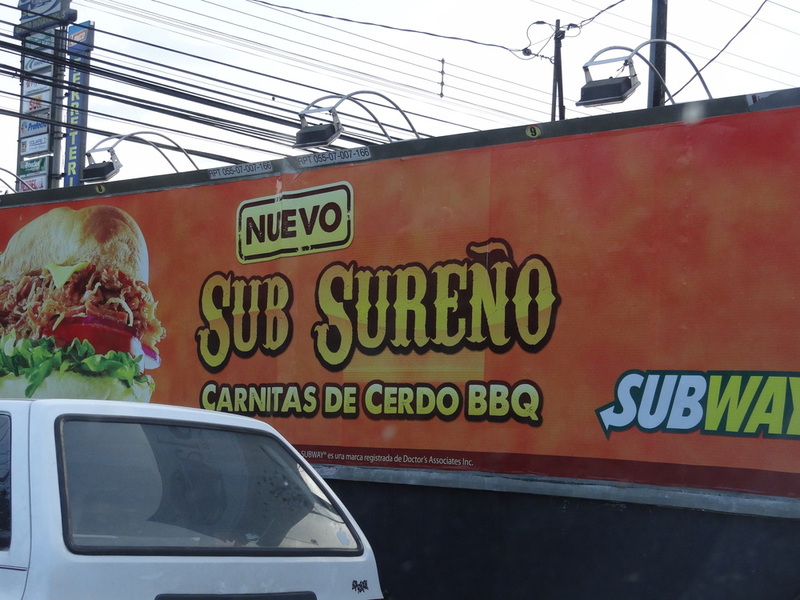 Also, I took a picture of a Subway sign because they were advertising this sandwich called “Sub Sureño” everywhere. Later on, I ended up getting it just so I could see what the big deal was. It was basically a “BBQ pork” sub. It wasn’t bad, but it could have used some chicharronnes in it. 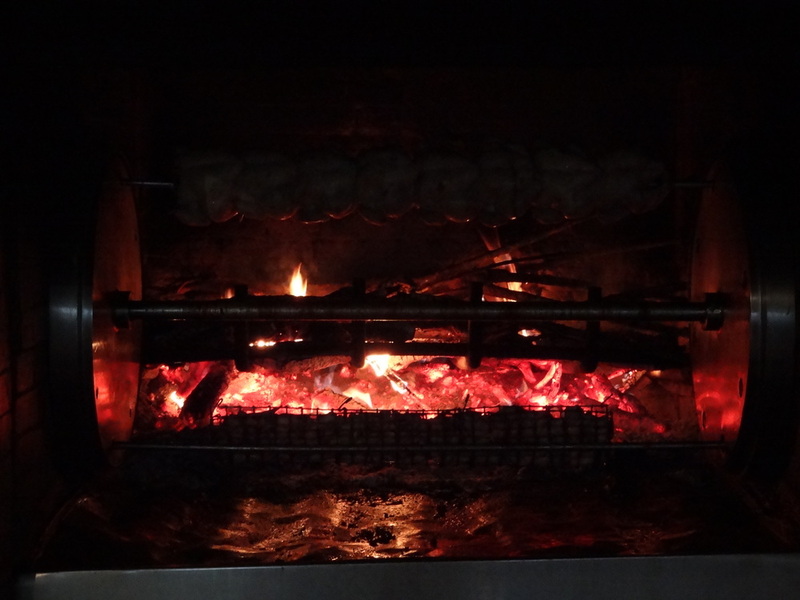 In the third picture of this gallery is a fire pit at a Rosti Pollos. They use wood from the coffee plant in their pit because it’s plentiful, cooks hot, and gives the chicken a unique, light flavor. On our way to Tortugeuro, our guide had the tour bus driver stop in the middle of the road while he stepped out to make a queso deal. I took this picture as evidence. It was good queso – I had it later that day with my dinner. 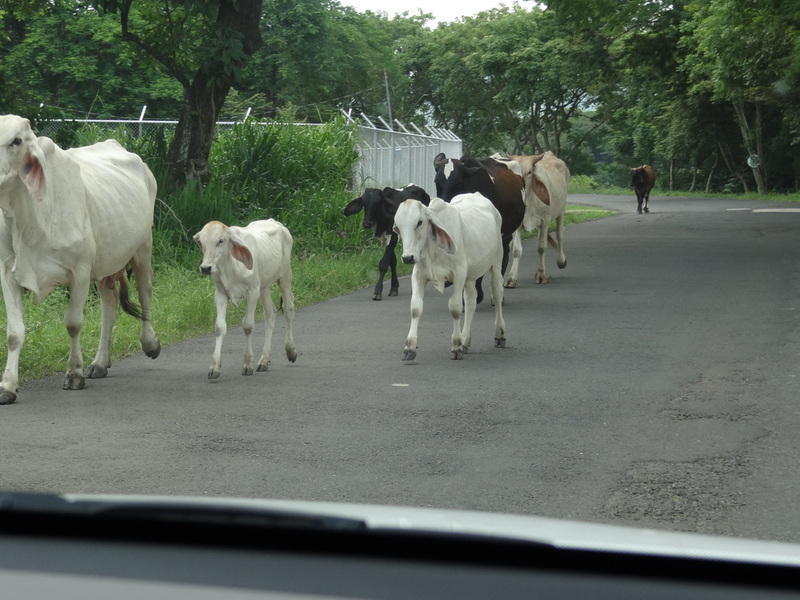 Beef is lean in Costa Rica. 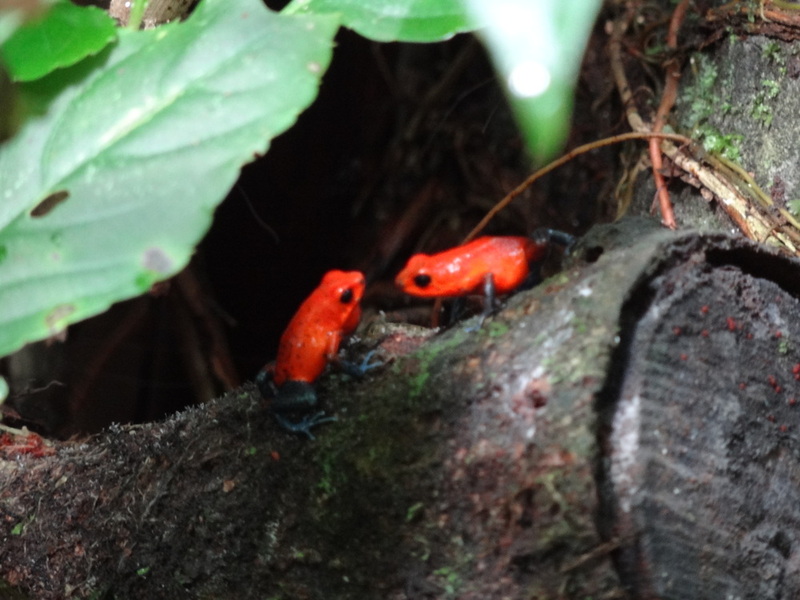 There are lots of unusual and edible animals in Costa Rica. These cute little fellas are just unusual. Don’t eat them, ‘cuz they’ll kill you. 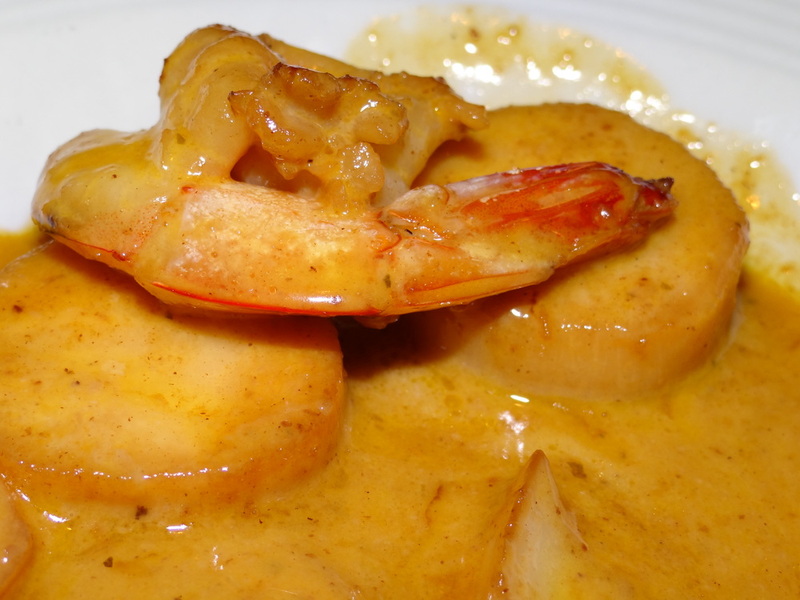 The most memorable part of my culinary experience was during our vacation-within-a-vacation in Playa Flamingo. We couldn’t afford to stay at a resort the whole time, so we only spent 3 nights there, but we did it in style and bought the all-inclusive package. I ate and drank my way through to a victorious value on the first night. 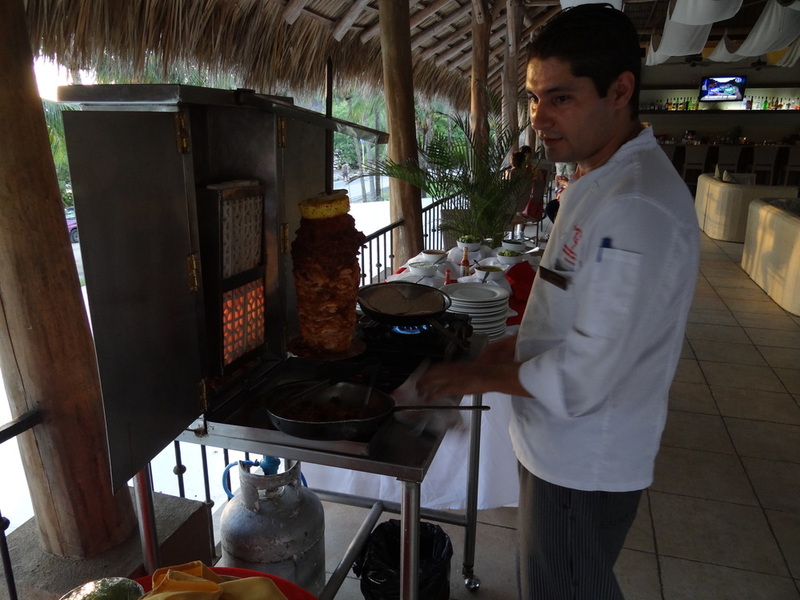 These next pictures start with Chef Carlos who was preparing some roast pork for taco night. I should add that Chef Carlos was the most welcoming, polite, and gracious Tico I’ve ever met. He went out of his way to make my family feel like we were the only guests at the resort. In most places we went, both the Ticos and Ticas were generally friendly, and tolerated my poor attempts at spanish verb conjugation, but no one delivered service like this guy. If you ever go to Playa Flamingo, look him up. 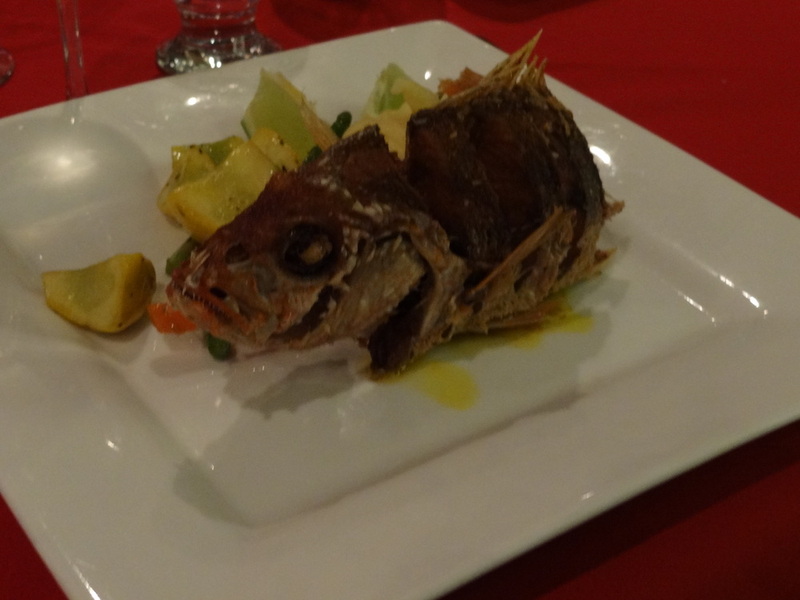 Pictures here include a whole, fried red snapper, that my son ate right down to the fins. 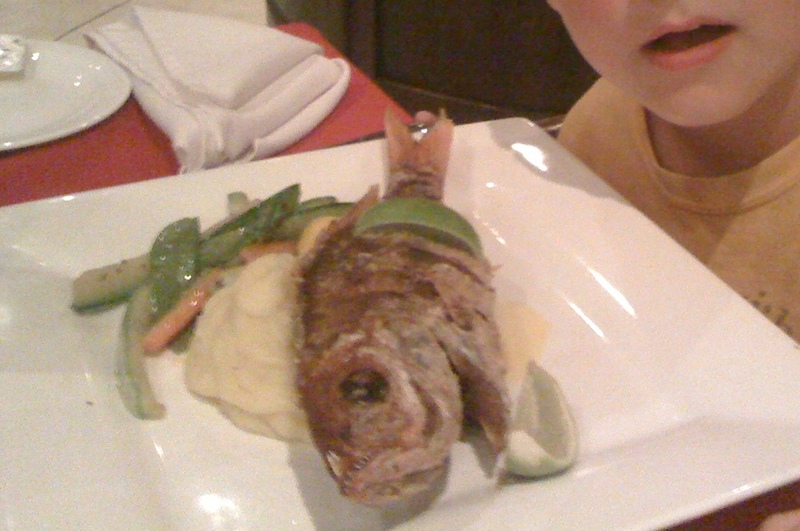 When he finished, he asked Chef Carlos, “can I eat the eye balls too?” I love that kid. 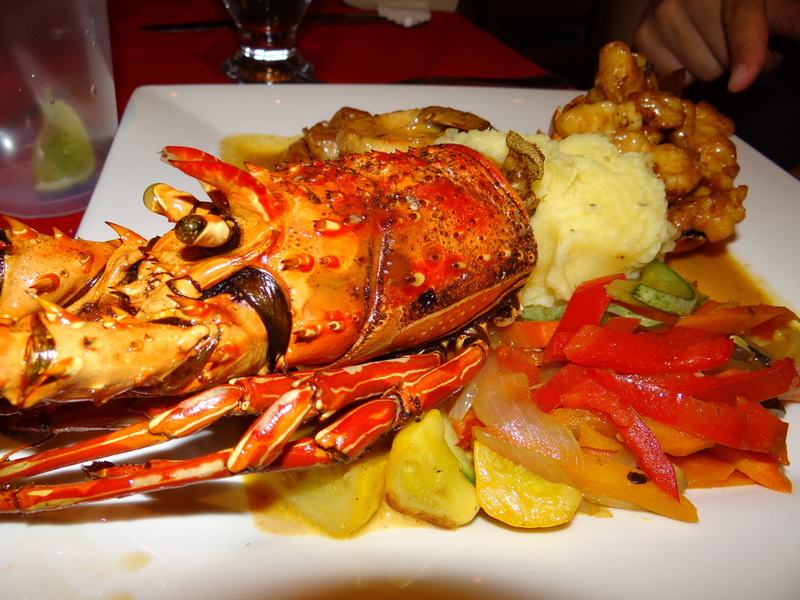 Also pictured is my whole lobster with shrimp and scallops. I even ate some of the gunk inside its head, although I don’t recommend it for everyone — it’s kind of chewy. 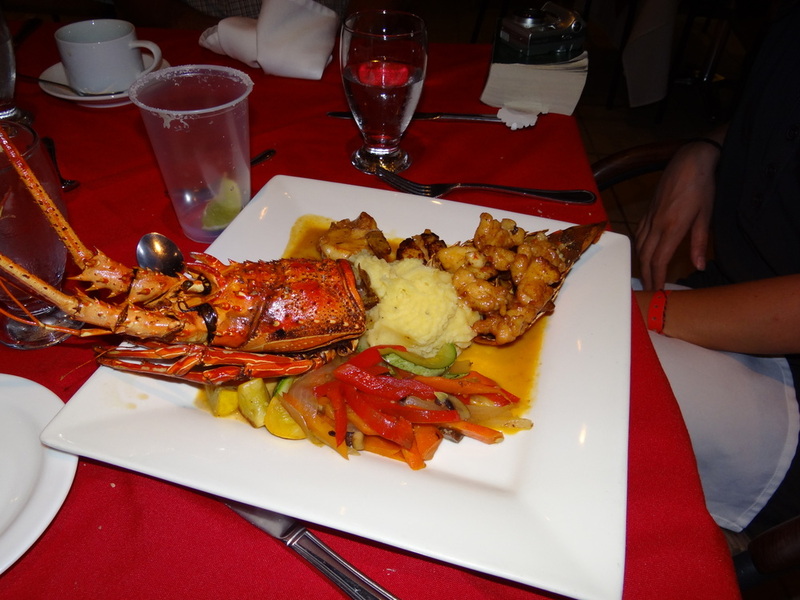 The lobster cost $6 since I bought the all-inclusive package. I’d like to describe it in great detail, but I keep getting stuck at the word “orgasmic” so I’ll just have to leave it at that. Later, I drank too many mojitos and ended up singing Sweet Caroline by Neil Diamond at a karaoke. There’s video. 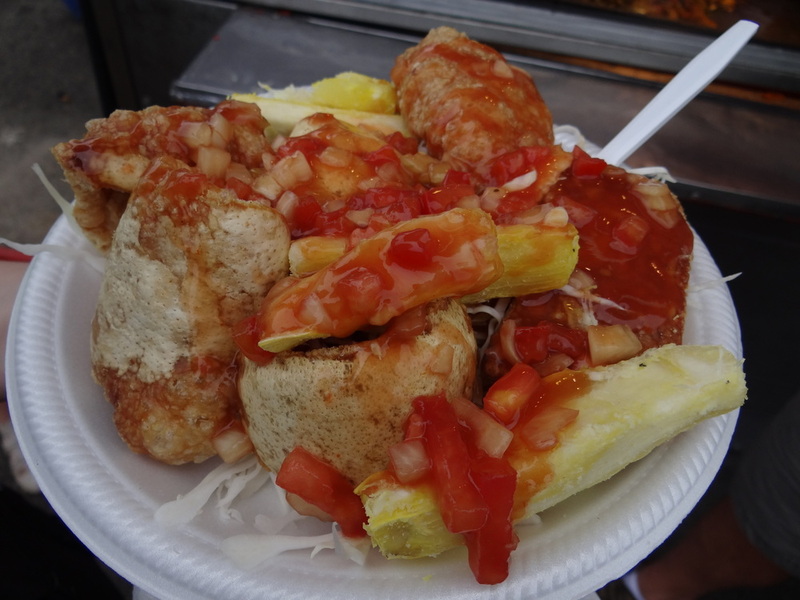 I’ll show it to you in exchange for chicharronnes. This next picture is of the bar where my wife got drunk for the first time when she was 17 on a school exchange program. Good times. In Costa Rica, the Cerveceria company is basically the only company that supplies beer. It’s pretty difficult to find anything other than the Imperial family of crappy beers. 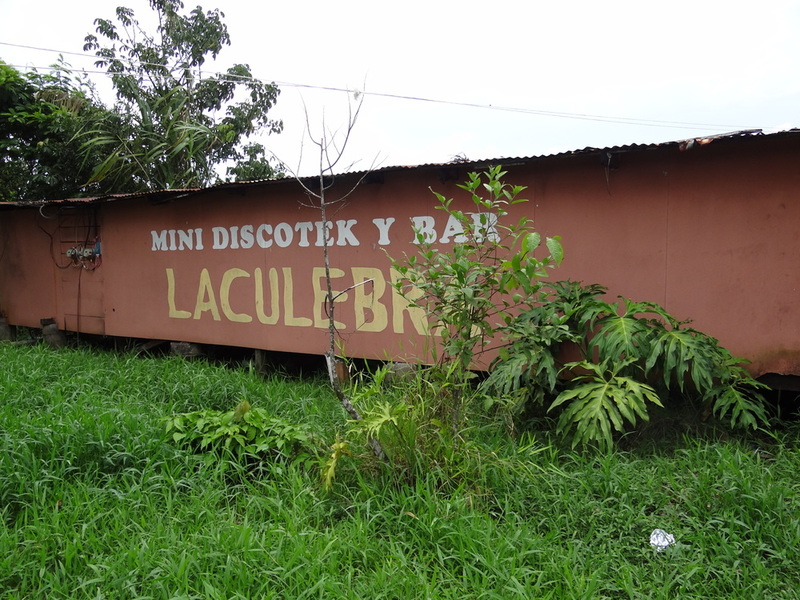 However, there are 2 known micro-breweries in Costa Rica, neither of which is very popular, but they exist. 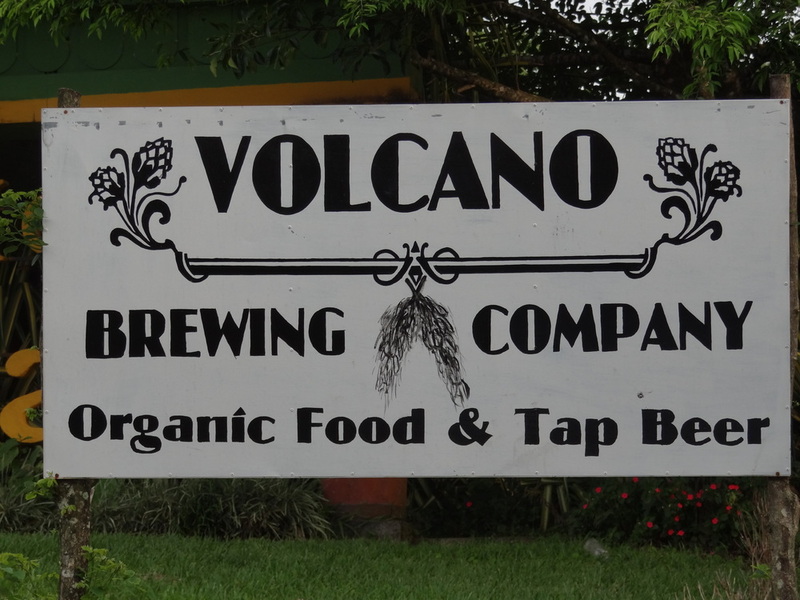 We stumbled upon the Volcano Brewing Company near Arenal and popped in for a pint. While we drank their mediocre wheat ale, I asked the guy how they go about getting supplies and ingredients to make beer when there’s a monopoly controlled by Cerveceria. He looked at me seriously and responded, “we smuggle it in.” It probably doesn’t lend itself to a long-term business plan, but I guess it works for them. 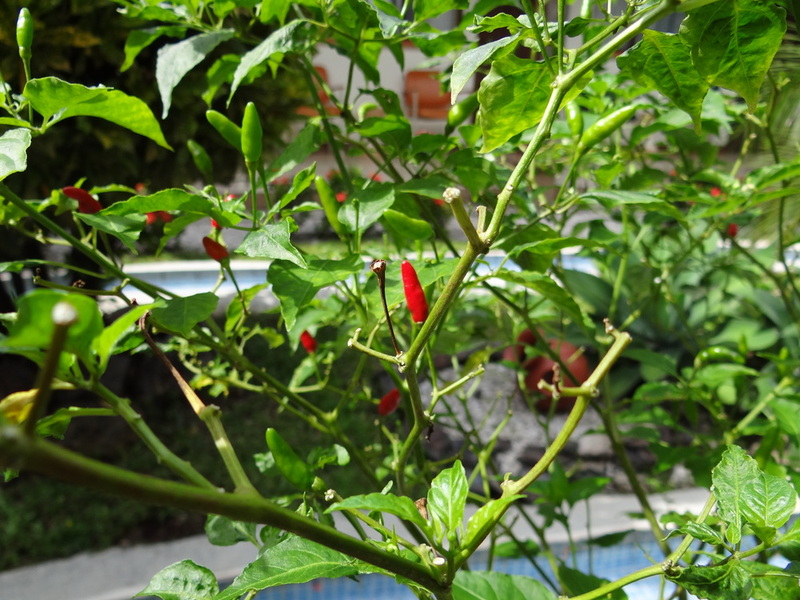 These peppers were in the courtyard at one of the hotels we stayed at. They were pretty damn hot. That’s pretty much it. It was a great trip. Very tasty. ← Wagon wheel of fun at @VTaphouse.